Tuition: $100 (monthly fee based on 4 lessons per month, all art materials are included). A one time $20 registration fee per child is applicable. 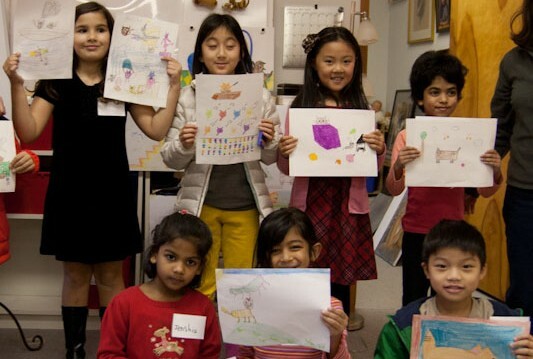 Please visit https://eacstudio.com/children-art-program/or email: eac-kids@hotmail.com if you have any questions. Classes are on-going and your child can sign up anytime in the month. If you enroll after a class has begun, tuition will be pro-rated. Class meets once a week. If your child is absent due to sickness or family matter, you will receive a make-up class coupon. Please notify your teacher a day before class if your child will be absent. If a teacher is sick, we will have substitute teacher for the class or will notify you 12 hours prior to class cancellation. A make-up class will be scheduled. Please pick up your child no more than 15 minutes after the end of the class time. For every bounced check, there will be a $20 fee. One free preview class is offered for all students trying out a class for the first time. $20 registration fee will be waived if the child is signed up within 5 days after preview class. Please sign to acknowledge the tuition rate and our policy. Please sign if you give permission for EAC to take photo/video clips of your child to be published and advertised in our marketing materials.